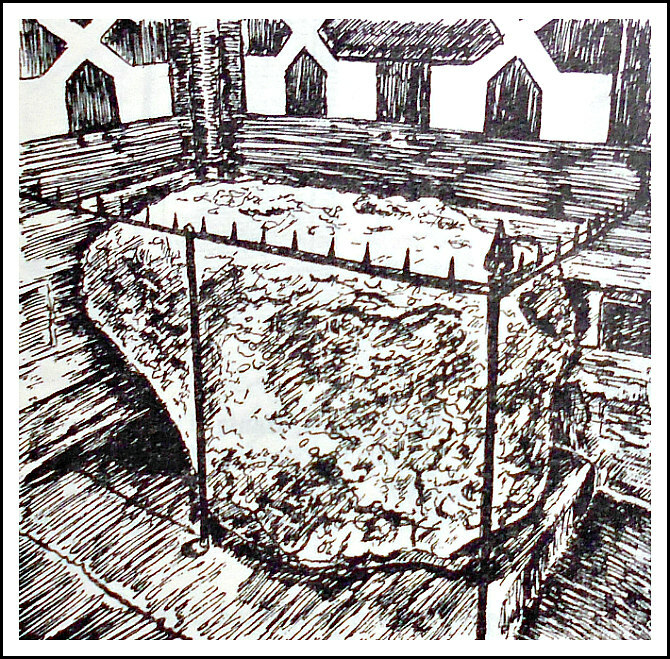 Maen Huail Stone at Ruthin, Denbighshire (Illustration). OS grid reference: SJ 1239 5828. At the front of Exmewe House (Bar-clays Bank) on St Peter’s Square (Market Square), Ruthin, Denbighshire, there is a large block of rude Limestone called Maen Huail (Stone of Huail). According to the legend, a 6th century warrior called Huail was beheaded upon the stone by King Arthur. The roughly square-shaped boulder could actually be a former standing stone; it is curved inwards at one side. How it came to be here is not really known, but it has no doubt stood here for some considerable time, although the stone has been moved on a couple of occasions to make way for modern-day building construction; at one point it had to moved from its original site to make way for a car park. It eventually came to rest at its present location Exmewe House which is also known as the HSBC bank. From history we know that Huail was one of the sons of Caw Cawlwyd of Brydyn, who was a chieftain of noble descent from the Lower Clyde region of Scotland. One of his brothers being the famous St Gildas the Historian (Barber & Williams, 1989) – the other two brothers were St Caffo and St Maelog, but unlike his brothers, he did not decide on a monastic life, far from it. Huail seems to have led the life of a troublemaker and womanizer, but he was also a chieftain and it has been suggested that he had his base on Moel Fenli, a hill-fort and British camp some 2 miles to the east of Ruthin. It would seem likely that the Maen Huail Stone was originally in use as a ‘market stone’ or ‘civic stone’ upon which business affairs were sorted, or it was ‘a preaching stone’, because at the end of the 17th century it stood in the middle of the market square; it measures 1.2m x 0.6m x 0.6m, according to coflein. The renowned author Geoffrey Ashe in his work ‘A Guidebook to Arthurian Britain’, tells us much more about the ‘Legend’ and personality of Huail. He says: “This warrior appears in Welsh stories as a dashing and resolute opponent of Arthur. Their first clashes were in the north. Raiding southward, perhaps as far as Wales, Hueil continued to make trouble. According to one chronicler it was not confined to matters of war. When Arthur was at Caerwys, about 9 miles to the north of Ruthin, Hueil arrived in the neighbourhood and paid court (presumably during a truce) to one of Arthur’s mistresses. A duel resulted, and Arthur was wounded in the knee. He promised that there should be peace between them so long as Hueil kept silent about the knee. However, he remained slightly lame. Ashe, Geoffrey., A Guidebook to Arthurian Britain, Longman, London, 1980. Barber, Chris & Williams, John Godfrey., The Ancient Stones of Wales, Blorenge Books, Abergavenny, Gwent, 1989. The AA, The Illustrated Road Book Of England & Wales, The Automobile Association, London WC2, 1961. Categories: Standing Stone | Tags: Maen Huail at Ruthin in Denbighshire Wales | Permalink.